Pakistan's ex president Pervez Musharraf has been sent on judicial remand till 4th May by an Anti Terrorism Court Saturday. The judge was due to rule on whether Musharraf could remain remanded in police custody or would have to be transferred to jail ahead of his next appearance, which is expected to take place in the next few days. 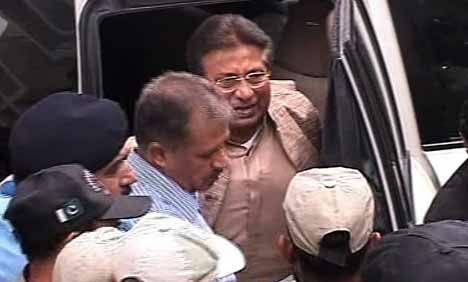 After the hearing, the security personnel escorted Pervez Musharraf outside the court from where he left for the Police Headquarters again under foolproof security.